There are many different types of campers, styles of camping and reasons to head outdoors. As adventurous women, we go for a connection to nature and to immerse ourselves in unspoiled environments that inspire us. Out there we seek the sports that drive us. Camping unites us to our passions - and keeps us there for longer. Here are some ideas for camping well so you’re comfortable every time you venture out. As a camper of many years and the author of the ‘how to’ guidebook, Camping in Style, I’ve experienced camping in all its forms - un-facilitated riverside camping weekends with groups of friends, to touring and staying in ‘jumping-pillow-territory’ caravan parks, to lightweight hiking in remote areas across Australia. Interestingly, experience reveals that the secret of camping well is not about the new things you can add to your camping kit it’s about what you can do without. Now my preference is for smaller tents, paired-down cooking gear and clothing limited to a few essential pieces. With a smaller tent and less gear, it’s easier to pack the car, find flat attractive camping sites and cleaning and storage at home are simplified. What is essential is choosing the best quality of the right gear. The starting point is anything to help you get a good night’s sleep. After all, rest and rejuvenation are what anyone seeks on holiday so it’s important to maximise comfort with the best tent, mattress, and bedding. The one thing your tent must do above all else is keep you dry. The survival rule of threes has shelter prioritised second… “You can survive three minutes without air, three hours without shelter, three days without water and three weeks without food.” So yes shelter is important! Think about the type of camping you will be doing to guide you to the most appropriate style of tent. I have accumulated three different types of tents for varying camping occasions. There is a heavy-duty canvas one for rugged base camping, where it will be exposed to many hours of harsh sunlight, wind and rain, a relatively inexpensive, but still waterproof, pop-up tent for touring, to help me get on the road quickly each morning. And a specialised lightweight hiking tent for carrying in my pack. 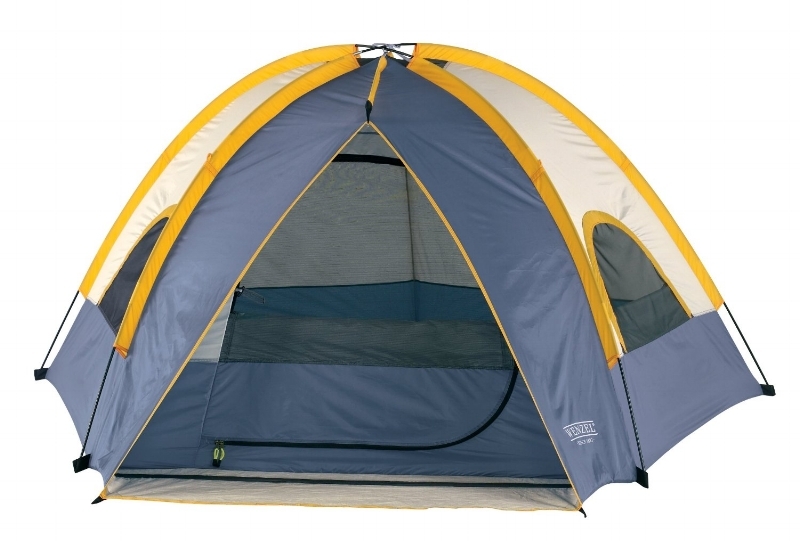 Tents can be assessed for quality of materials in floors, zips, mesh-screening, poles, and pegs. A tent that’s quick to set up with fewer poles is key to making a camping trip easier. When you’re tired and the weather is against you - through excessive heat, wind or rain - you’ll want anything to speed the process of set up and pack up. And once you have your quality tent, look after it by always storing it away clean and dry. Even if this means setting it up at home to fully dry. Lucky for new campers the choice is endless for comfort options in sleeping mats. Advances in technology have taken camping mats to a point where they can almost match the comfort of a home mattress. The brand Thermarest offered one of the first innovations in self-inflating styles, replacing simple foam mats. Now there are any number of brands, like Exped, Sea to Summit, OzTrail, Klymit and Black Wolf offering everything from mega thick self-inflating mattresses to insulated blow-up types. Once I would have warned against a blow-up mattress, as they provide absolutely no insulation from a cold ground, but today brands like Exped have them filled with down or synthetic insulating fibres to help maintain your body heat when the temperature drops at night. Mats can be categorised into different sizes, weight, thickness and insulating properties. Insulation efficiency is determined by a recognised, and comparable, unit of measurement called the R-Value. Generally the thicker the camping mattress the higher the R-Value and the better the thermal performance. Comparing R-Values becomes most important when selecting a mattress for hiking. This is because you might need to sacrifice thickness, insulation, and size for minimising weight. Pick the one that will accommodate the coldest environment you are likely to encounter. To be assured of comfort in any mattress, try it out in store first. 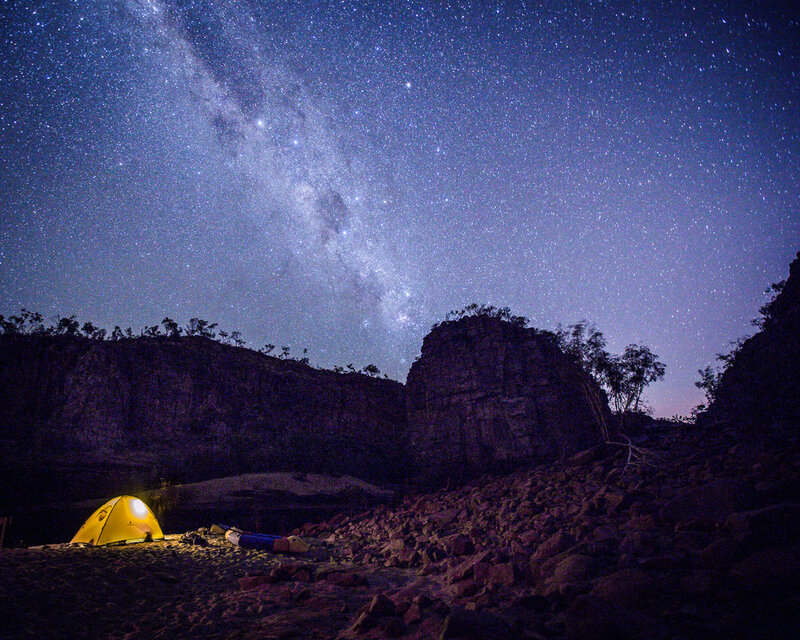 For car camping, bedding can be as simple as taking your sheets and doona off the bed at home. This will provide the most luxurious set-up and there’s no extra expense. Make sure you have plenty of layers, perhaps adding rugs, so you can adjust your temperature throughout the night. Pack your bedding well for transit in a large duffel bag. When you’re ready for the expense, a sleeping bag is a great option and will also give you the chance to go hiking. Down bags have the advantage of keeping weight down for hikers. Synthetic bags are heavier and bulkier and can be advantageous for car campers on longer trips as they can be washed regularly. Sleeping bags are also rated to minimum temperatures at which you can maintain comfort, and again it’s best to select the bag for your coldest intended sleeping condition. Coupling the bag with an inner silk liner is advisable. It will slightly boost the warmth of your bag, keep your sleeping bag clean and provide options for greater regulation in sleeping temperature. An insulating bivvy can also be added as an outer shell if you plan on sleeping in really cold conditions and want to further boost the warmth of your bag. There are two other, mini, and ultra handy essentials to aid a good night’s sleep - earplugs and a sleeping eye-mask. With noises in the wild always unexpected - from pounding seas to alpine winds, mating koalas or early rising kookaburras - this miniature piece of kit can shut the door on them all - if you choose to. And at sunrise, a sleep mask will help you catch a few extra minutes, or hours, of precious sleep when sunlight hits your tent. The best way to keep your gear to a minimum is, to begin with, the base necessities and add from there. A trusty hiking list forms the perfect basis. Hikers know how to pair things down to absolute minimums to keep the weight of their packs down. Car campers can add whatever else they want that fits in their sized vehicle. However, for the easiest and cheapest way to start camping, it’s best to keep gear contained. I have found the hiking checklist by Caro Ryan from Lotsafreshair, contributor to Travel Play Live, to be very thorough. Clothing essentials should include hiking pants, shorts, t-shirt, thermals, fleece, puffer jacket, underwear and socks, sunhat, beanie, gloves, rain shell and waterproof over-pants. Car campers can simply step it up in quantities of each and maybe add some nice going-out-in-town wear. It’s fun to experience a taste of aberrance by dressing up and dining at a top restaurant after just crawling from your tent. Lighting at camp begins with a head torch as a minimum. For hiking, this may be your only light, but for car camping, you can add an additional ambient light - such as a battery-powered lantern or 12-volt plug-in light. A gas lantern is my preferred choice as it conveniently shares the same gas bottle as the cooking stove and light levels can be adjusted down throughout the evening helping maintain your night vision. Seating at camp can be as simple as a foam pad on the ground for hiking, to the various array of tent chairs and tables for car camping. Keep them as small and light as possible for your needs as you’ll be picking them up and packing them up regularly, and needing to find a place to store them at home. Choosing to cook at camp introduces complexity and a need for more gear - such as a heat source for cooking and refrigeration for perishable foods. There are challenges in selecting and packing the types of foods you’ll enjoy, and that will sustain you on your trip. You can choose to make it as hard or easy as you like. Hikers keep it simple with dehydrated pre-packaged one-pot-meals and high energy snacks for the day. Cooking is done on small butane stoves or Trangias running on methylated spirits. Stepping it up to full-scale car camping means running a gas cooker requiring a refillable gas bottle or cooking on a fire requiring new cooking skills and equipment. The simplest refrigeration is an esky with ice and your food stored in well-sealed plastic containers like Lock and Lock that won’t leak. On a grander scale, there are car fridges, but they are costly and may require backup systems so they don’t draw on your car’s battery to the point of leaving you stranded. Being clear on the type of camping you want to experience will guide you to the gear you need. It’s still possible to keep car camping totally simple by treating yourself to every meal in town. When camping is as simple as possible, that’s when it’s the most enjoyable. Heading outdoors is about getting back to basics. Once you’ve dealt with the essentials for comfort, take your focus away from the gear and direct it where it should be - experiencing simple, sustainable adventures in the wild. Let nature speak for itself and have it be your focus. This article appeared in the Travel Play Live Magazine or this is some awesome bonus content that supports our Print issue.